The feast of Our Lady's Immaculate Conception is an opportunity to form children's interior life. On this day we celebrate Mary being conceived, by a special grace of God, without original sin. Our Lord's human nature came from Mary who was preserved from all stain of sin. There are surprisingly many customs for this great feast of Our Lady. Besides going to Mass and praying the Rosary, visiting a shrine or grotto would be very nice. Within the home a consecration or renewal of each member of the family to the Immaculate Heart can be done this day. Talk about original sin and the effects of baptism and teach your children to pray that their baptismal innocence will remain until the day they die. 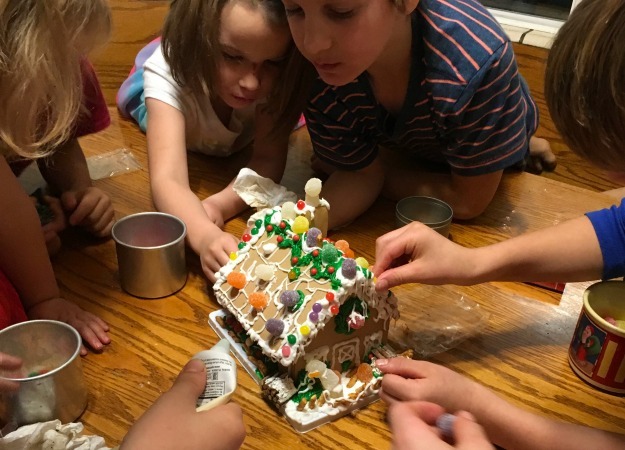 Fun activities for the day include a Miraculous Medal craft and making ginger bread cookies or houses. Ginger, cinnamon, cloves, vanilla...mmm-the odor of sweetness. Ginger bread cookies are associated with this feast day and the seasons of Advent and Christmas. Today is a nice day to make some cookies or begin the custom of building a gingerbread house. There are many ginger bread house kits available. The fragrance of spices used in gingerbread cookies symbolize the purity and sinlessness of Mary. In the Canticles of Canticles especially the first chapter, words like odor of spices and sweetness, ointments and bridegrooms have been applied by the Church to Our Lady. 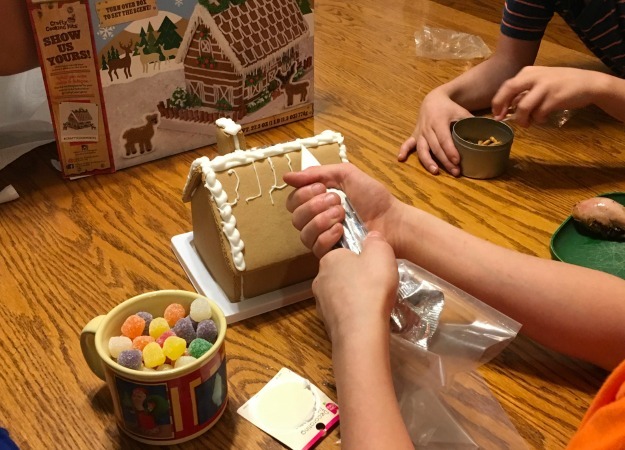 Not only does the sweetness and fragrance of gingerbread remind us of Our Lady but spice drops and other decorations used on gingerbread houses serve as a reminder of the sweetness of keeping our baptismal innocence and the goodness that awaits us in heaven. Print or draw an image of the Miraculous Medal on two sheets of paper. Cut these sheets and the 2 foam sheets into the same oval shape. Cover the foam ovals completely with heavy duty aluminum foil. Tape the the image on the front of each foil-covered foam sheet. Trace the pattern pressing heavily with a slightly dull pencil. When you remove the paper you will have an embossed image. You will no longer need the papers you traced. Poke a hole through the two ovals that are now embossed images of the front and back of the Miraculous Medal. 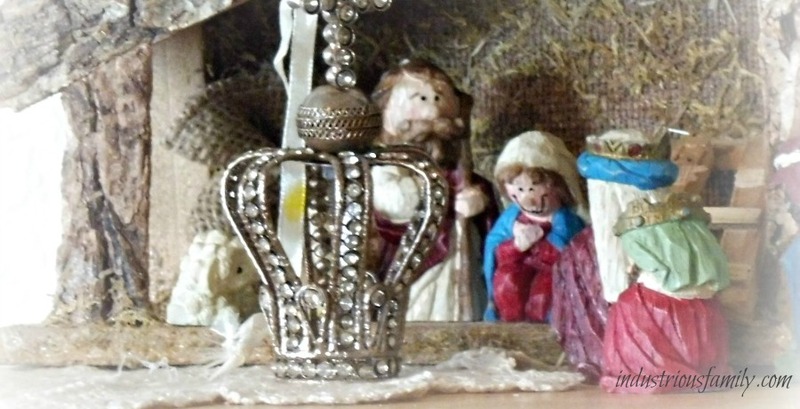 Thread the key ring through the "medals" and then hang on the wall near the family altar. This craft is adapted from Seton Educational Media's Art 1. It is a wonderful book. We have used it a lot over the years for crafts related to the seasons and holidays of the liturgical year. Another resource that is helpful for this project is the book Leading the Little Ones to Mary. There is a section on the Miraculous Medal that can be used in conjunction with this project. This book is indispensable in establishing a lifelong devotion to the Blessed Virgin Mary during childhood. Before the family altar beg for Mary's special protection of your children all throughout their lives and especially at the hour of their deaths. After this consecration renewal, pray the rosary. Parents should pray like Queen Blanche of Castile and beg to have such children as St. Louis IX. The queen had told her only son that she would have rather seen him dead at her feet than have a mortal sin on his soul. To his death, he preserved his baptismal innocence. Blessed Virgin Mary, Queen of Heaven and earth, to your Immaculate Heart, the channel of all graces, we consecrate our children, (here list names) whom we have received from God's goodness. We offer them to you, that you may present them to your Divine Son, that you may take them under your loving maternal protection, that you may preserve them from dangers, that you may keep them from all sin, that you may make them grow in piety and in all virtue, so that they may always be worthy to call themselves your children. May they grow daily in wisdom and grace, may they go through life having you always as their refuge and their Mother. May all virtue shine in them and may they never offend your maternal heart. May the Eternal Father look upon them with delight and see in them a ray and reflection of your Immaculate Beauty. As today they gladden our home, so may they one day gladden the Eternal Home, which we pray will be theirs. Praying for the preservation of your baptismal innocence is a good habit for both you and your children. Also praying for the grace of a happy death and final repentance is another good habit. Today is a good day to renew baptismal vows and a simple and effective way of doing this is praying a fervent profession of faith such as the Apostles Creed. Besides attending Mass and praying the Rosary, these customs will engrain in your children a deep devotion to the Immaculate Conception of Our Lady. Do you have any fun Catholic family customs for this feast day? If so, we would love to hear about them. Post them in the comments section below.